Alan Wake, created by Remedy, is a third person action game, psychological thriller and love letter to the early works of Stephen King. You play as the titular Alan Wake, a famous horror writer who, along with his wife Alice, leaves New York City to vacation in the rural American Northwestern town of Bright Falls in hopes that it will alleviate his writers block. However, before you even have a chance to settle into your quaint little cabin on Cauldron Lake, your wife is stolen away by a malevolent force known only as the “Dark Presence”. It is an entity of absolute evil that can possess people to do it’s bidding. 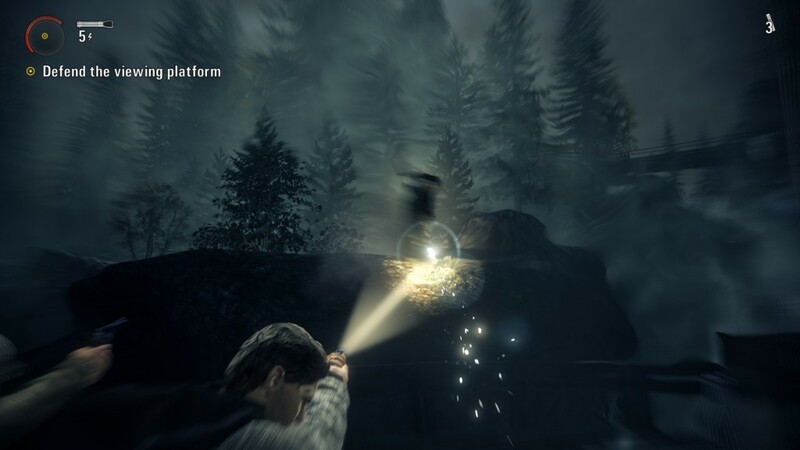 In Alan Wake, combat is a “one-two punch” affair. Locals possessed by the Dark Presence, known as the “Taken”, are sheathed in shifting shadows which render them invulnerable to all damage. To combat this, Alan has his trusty Energizer brand flashlight, which he can focus on foes until the corona around them collapses, opening them up to physical damage. A majority of the Taken can conjure weapons to throw at you. You can dodge away from them in a smoothly implemented cinematic bullet time event. When enemies are surrounding you from all sides and you have monkey wrenches and hammers flying at you from all angles you get the claustrophobic impression of having your personal space violated quite frequently. The Taken have an uncanny ability to appear out of thin air and in your blind spot. 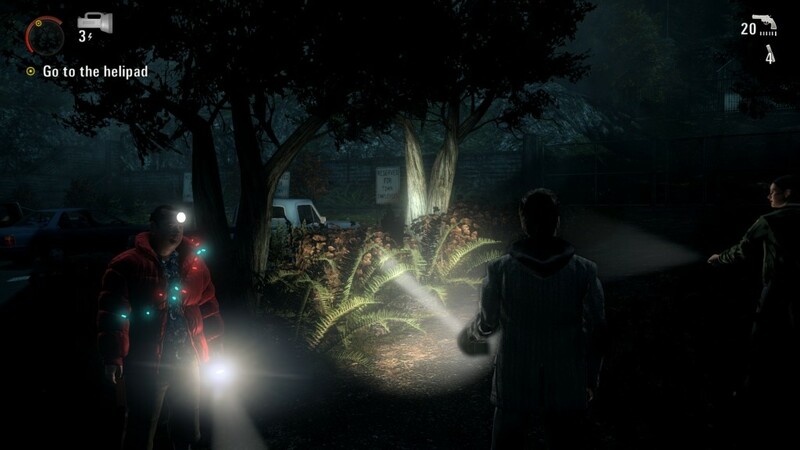 To overcome this distinct disadvantage Alan can sometimes sense when an enemy is approaching, this causes time to slow and the camera to pan back placing Alan and the previously hidden antagonist into view, granting you a few precious moments to wheel around and catch the shadowy attacker in the cone of light cast from your flashlight. The array of weaponry at your disposal can be utilized very organically. Road flares create a temporary AoE that keeps the yokels at bay and slowly fizzles away their protective cloaks of darkness, the flare gun eliminates the need to burn away enemy shielding though ammunition is perpetually scarce and Flash Bang grenades are the equivalent of a Weapon of Mass Destruction against an enemy of pure darkness. Several times during your playthrough Alan breaks the 4th Wall and comments on how senseless it is that these munitions should be found in such nonsensical locations, it isn’t until much later in the story that you learn your adventure has been preordained and someone has been stocking these supplies for your inevitable arrival. A few weeks ago, our own Mr Prest wrote a review of Alan Wake’s American Nightmare, a DLC featuring the now well known fictional writer. A few days prior to that Remedy released their long awaited PC port of Alan Wake. Contrary to most peoples expectations, this port is the superior version of the game originally released for XBox 360 last year. This is actually my second purchase of Alan Wake, originally I bought it for the XBox 360 when it was initially realeased over a year ago. At the time I was underwhelmed by the muddy textures and oppressive, repetitive coniferous forest surroundings. 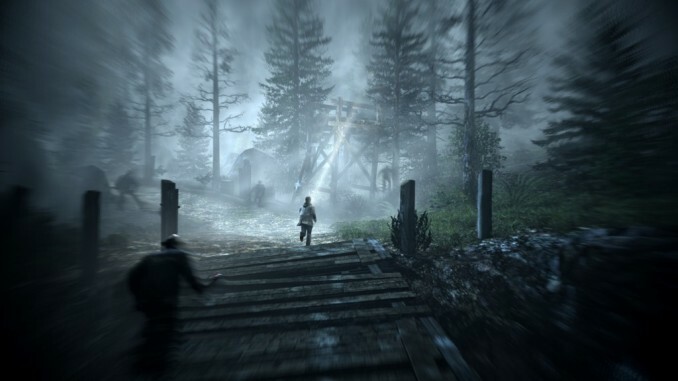 The PC Version of Alan Wake is the definitive version. When I saw Alan Wake on Steam I again became intrigued by the premise and repurchased it. The PC Version of Alan Wake is the definitive version. With vastly improved textures, astounding lighting effects and some truly amazing use of Shaders, the world of Bright Falls is frightfully realistic or rather surrealitic. The first time reality begins to swirl and swim around you like you’ve been painting a room without ventilation you will be transplanted into this quite impressive work of (if not entirely original, still legitimate) art. 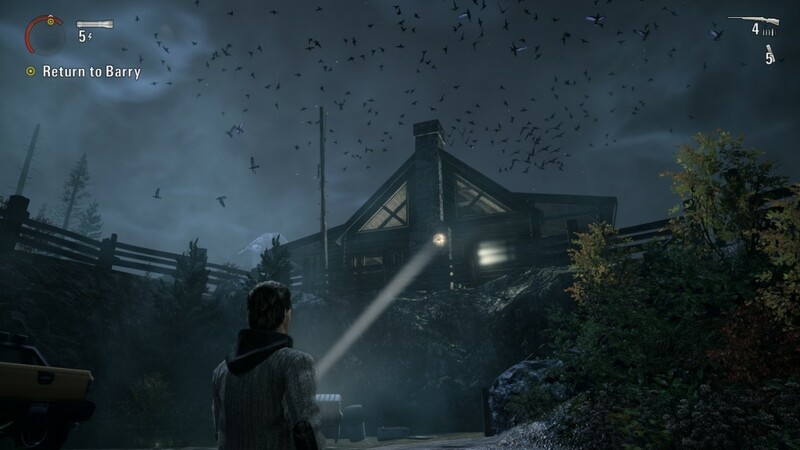 Alan Wake isn’t a survival horror game, though it does satisfy all the cliches on the list: Demonic possession, scarcity of resources and a fair amount of cheesy dialog. It just isn’t a particularly frightening game. Except for a few trains unexpectedly falling out of the sky there were few times in the game that made me jump or “on edge”, what Alan Wake does do well is worm it’s way into your psyche as it tells the tale of an anchient lovecraftian malevolence capable of using people and objects in it’s elaborate ruse to use Alan Wake’s abilities as a writer to escape it’s prison. The “comic relief” is a character archtype that is as old as literature itself, their job is to lighten the mood and to act as a humorous sounding board for the protaganists otherwise dry narrative. The unfortunate thing is that very rarely are they actually funny. (see: the Imp from The Darkness 2) Thankfully in Alan Wake, your agent Barry Wheeler is actually quite hilarious. At one point you are seperated from him and then suddenly he reappears wearing a head mounted lamp and draped in Christmas lights to repel the darkness “like garlic is to Vampires”. It was hilarious. Several times during your playthrough you will stumble across televisions playing a Twilight Zone parody called “Night Springs”. These quirky stories have the same campy appeal as the show-within-a-game ”Address Unknown” from Max Payne 2, also created by Remedy. It felt extremely fitting with the somewhat serious and somewhat playful nature of the game. I applaud Remedy’s sense of humor and attempt at continuity between game series’, especially considering they are not the developers of the upcoming Max Payne 3. Combat at times can be very difficult. The further you progress in the story, the more enemies show up with increasing frequency. They’ll have stronger “shielding” and appear in arrangements that make it very difficult to survive. I haven’t become as vocally upset by a game (read: yelling at my monitor) in a long time as the shear steepness of it’s difficulty on the Normal setting becomes a ridiculous, against all odds, attempt at survival. the challenge of most of the gameplay is centered around the idea of scarcity…yet Jim-Bob can toss tire irons at you till the cows come home. 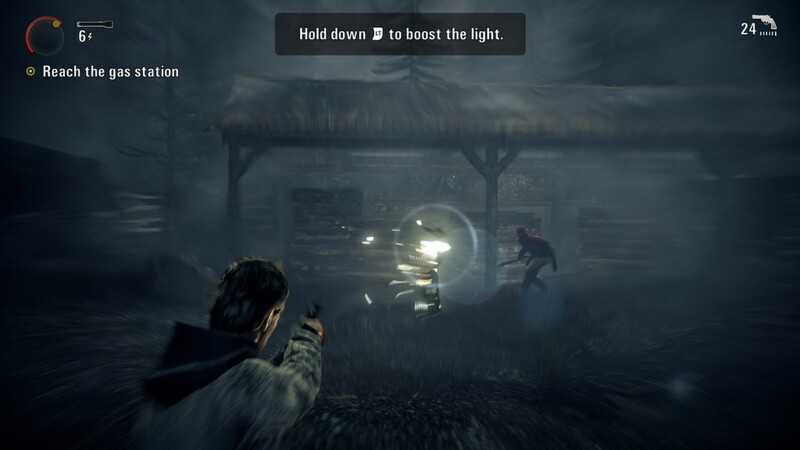 The most annoying aspect of Alan Wake is the enemies abilities to infinetly throw weapons at you. Plaid wearing hicks will be launching half a dozen hatchets or butcher knives at you while they close in. You will need to dodge them constantly to keep from becoming stunned. What makes it so frustrating is that most of the game’s challenge is centered around the idea of scarcity, you’ll never have enough bullets (which is arbitrarily set at a maximum count of 42) or flashlight juice, yet Jim-Bob can toss tire irons at you till the cows come home. Two sections in particular were extraordinary frustrating. Twice during your gameplay you will be forced to cross a bridge where all the inanimate objects become projectiles for poltergeists. Trying to dodge multiple flying barrels and truck tires without clear visual indicators as to when they’ll come launching at you with health bar destroying speed is really annoying. During each groan inducing scenario I died easily ten or more times in a row. In case of Emergency…Use these bullets! Also, because Alan Wake is seperated into chapters, the beginning of each strips you of all the weapons and equipment you have accumulated. This is very counter intuitive because if you spent your time carefully and strategically holding onto as many Flare Gun rounds and Flash Bang Grenades as possible you are rewarded by having them stripped away from you, wasted opportunities. You reappear after a cut scene with only your starter pistol and a low wattage flashlight. 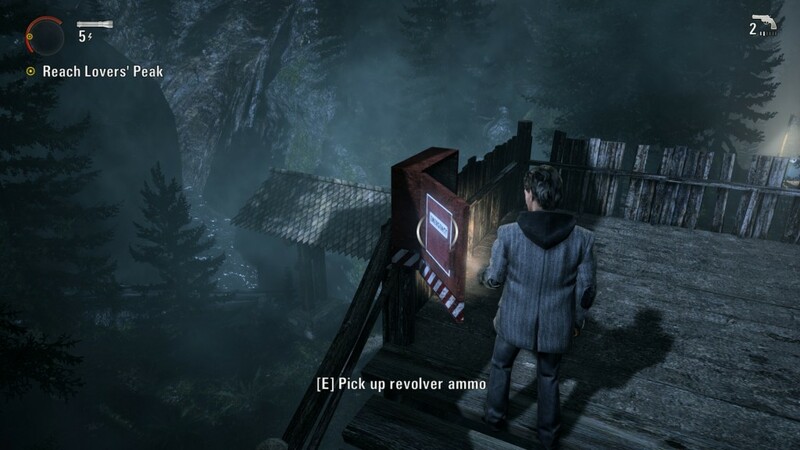 Alan Wake is a fun game. The world is meticulously crafted and the action is extremely tight for being a game where the protagonist wears a coat with elbow patches. While the settings and characters aren’t entirely original the game does an excellent job of casting characters and presenting events in believable and intriguing ways. If you haven’t played Alan Wake on XBox 360, or if you have but want to play it with improved visuals and some minor remixed content then you should definitely pick this game up. Why so high? Exhilerating combat, intriguing story, well defined characters, robust environments. Why so low? Constantly threatens to make the experience unplayable if you aren’t always conscience of rationing your ammunition. Giving Alan a melee attack mechanic would be the most significant improvement if there were to be a sequel.